We would like to take this opportunity to recognize the many contributions that Surveyors have made in shaping the very fabric of this nation. From documenting land boundaries and subdividing land, to establishing the control monuments and measurements used to build our nation's infrastructure, Surveyors play a vital role in many unseen aspects of our life. As a Professional Surveyor, I have a deep respect for the history of my Profession and the individuals who came before me - including George Washington, Thomas Jefferson, Abraham Lincoln, and many of this country's founding fathers. It is because of this pride and love of Profession that we say that there are 3 Surveyors and some other guy on Mount Rushmore. 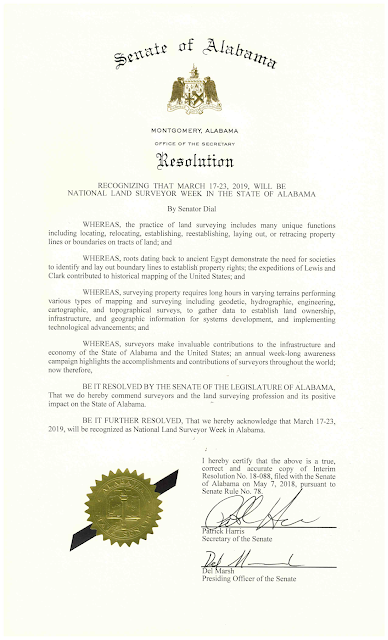 Below is a proclamation from the State of Alabama recognizing Surveyors this week, one of many states and counties providing similar proclamation across the country this week.